Height 10 to 14 inches. Dogs outside these limits should be faulted. Weight in proportion to height. In proportion, the Miniature Bull Terrier should give the appearance of being square. The head should be long, strong and deep, right to the end of the muzzle, but not coarse. The full face should be oval in outline and be filled completely up, giving the impression of fullness with a surface devoid of hollows or indentations, i.e., egg shaped. The profile should curve gently downwards from the top of the skull to the tip of the nose. The forehead should be flat across from ear to ear. The distance from the tip of the nose to the eyes should be perceptibly greater than that from the eyes to the top of the skull. The underjaw should be deep and well defined. To achieve a keen, determined and intelligent expression, the eyes should be well sunken and as dark as possible with a piercing glint. They should be small, triangular and obliquely placed, set near together and high up on the dog's head. The ears should be small, thin and placed close together, capable of being held stiffly erect when they point upwards. The nose should be black, with well developed nostrils bent downwards at the tip. The lips should be clean and tight. The teeth should meet in either a level or scissor bite. In the scissor bite, the top teeth should fit in front of and closely against the lower teeth. The teeth should be sound, strong and perfectly regular. The feet are round and compact with well arched toes like a cat. The coat should be short, flat and harsh to the touch with a fine gloss. The dog's skin should fit tightly. For white, pure white coat. Markings on head and skin pigmentation are not to be penalized. For colored, any color to predominate. The dog shall move smoothly, covering the ground with free, easy strides. Fore and hind legs should move parallel to each other when viewed from in front or behind, with the forelegs reaching out well and the hind legs moving smoothly at the hip and flexing well at the stifle and hock. The dog should move compactly and in one piece but with a typical jaunty air that suggests agility and power. Click Here to Learn about breeder background checks on Miniature Bull Terrier breeders if you are looking for Miniature Bull Terrier puppies for sale. Click Here to learn how ResearchBreeder.com can help you find healthy Miniature Bull Terrier puppies for sale. Click Here to order a Breeder or Kennel Background Check on Miniature Bull Terrier Breeders that may have Miniature Bull Terrier puppies for sale. Click here to find the national breed club for Miniature Bull Terrier puppies for sale. 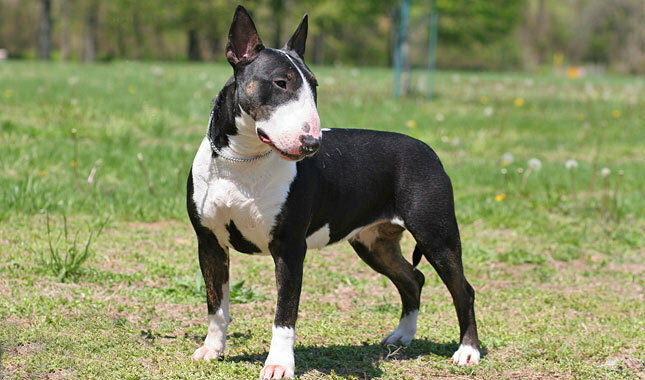 Click Here to purchase a list of approved ResearchBreeder.com Miniature Bull Terrier Breeders who have Miniature Bull Terrier puppies for sale.